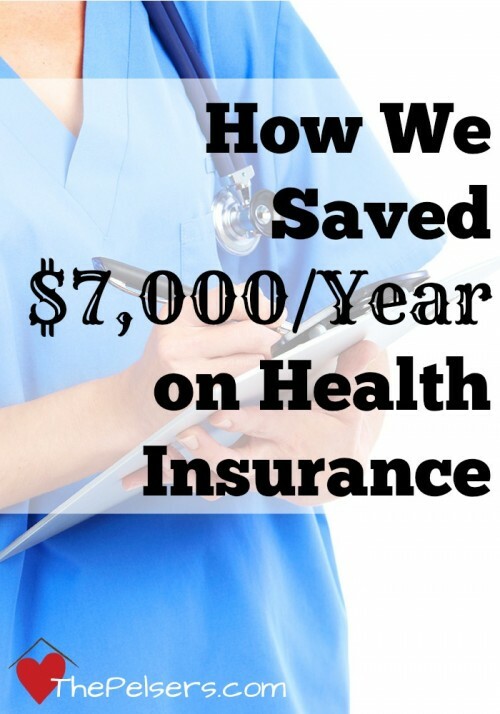 This post was originally written after the 2012 elections. The tips and reminders still hold true following the 2016 elections! Jonathan really got into the election this year. He's only 5. I'd venture to say that he was more excited and invested in this election than most adults who have the right to vote. We went as a family last night to vote when Josh got home from work. When we arrived at the polling place, Jonathan was disappointed that it was dark and there were few people there. Apparently, he's was expecting them both to be at our little country church polling place waiting for him. He was expecting a campaign rally type event like he'd seen on TV. Turns out, the actual voting event is pretty boring for a 5-year-old. But he survived. He watched me mark my ballot and got his “I voted” sticker. 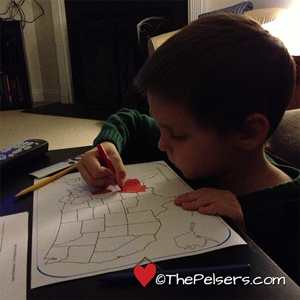 Jonathan spent the evening watching the election results and coloring the states red and blue on his map. He fell asleep on the couch around 11pm. And Jacob? 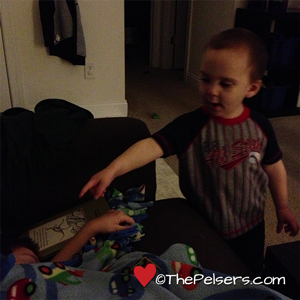 Well, he was still going strong at 11pm and telling his brother to wake up! After all the watching and waiting, today is going to be a very disappointing day for Jonathan. He is going to be very sad that Obama was reelected for four more years. How will I handle this? I'm disappointed too, but there are Biblical concepts that I need to pass on to him in the midst of this. We were reading in our Who is God? book just yesterday about the Trinity and how God is sovereign. We've learned that God is outside of time. He knew who would win this election. What do we do? We still trust God. Again, in Who is God?, we've been learning about the concept of worldview. Everyone has a worldview, a set of glasses through which they view their world and act within it. Some people don't believe in God and trust Jesus as Lord, so they don't see things through the lens of the Bible. Even Christians have differing opinions on things that are not essential tenets of Christianity and they will act based on that worldview. What do we do? We share Jesus with those who don't know him and we have respectful discussions with Christ-followers who disagree with us. God expects us to be good citizens, even if we disagree with our leaders. We submit to their authority. As Americans, we should also be thankful that we have the freedom to vote for our leaders. What do we do? We are careful with our words and the attitude of our hearts towards our leaders. Most importantly we're called to pray for our leaders. It doesn't matter who those leaders are or what they believe, we are to pray for them. What do we do? We regularly pray for those in authority over us. 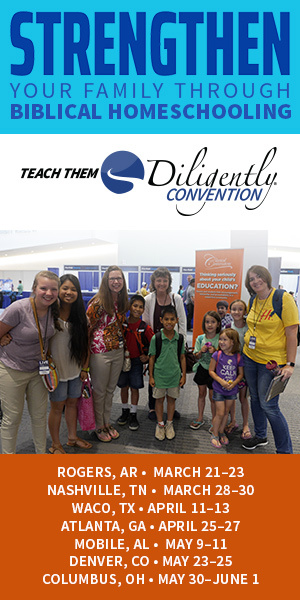 The What We Believe series from Apologia is a great resource for helping your elementary through middle school aged kids understand what's going on around them from a biblical perspective. 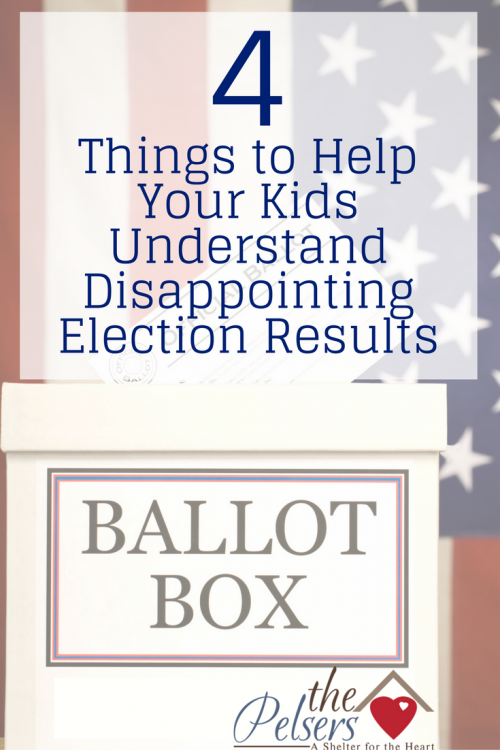 Printable to help you teach your kids to have a godly attitude following disappointing election results. Yes and know that this is a true reflection of the heart of America. The Amendments voted on and those voted into office are a direct reflection of our society. That is what makes me sad.